The first ever Show & TEL showcase event for the Faculty of Arts and Human Sciences, held in the University of Surrey’s Oak Suite meeting rooms on 20 February, featured two speakers from the School of Arts. Organized by the Department of Technology Enhanced Learning (TEL), the one-hour lunchtime event brought together some 30 academic and educational support staff from across the Faculty and beyond. The showcase aimed to establish a forum for discussing recent innovations in technology-enabled teaching and their outcomes, as well as providing opportunities for informal networking and the sharing of best practices. Dance lecturer Karen Da Silva (pictured) talked about the challenges faced across the HE sector of meeting students’ expectations regarding feedback, explaining that innovative online solutions using the University’s Virtual Learning Environment, SurreyLearn, can be effective in supplementing and reinforcing feedback offered initially within the context of the classroom. 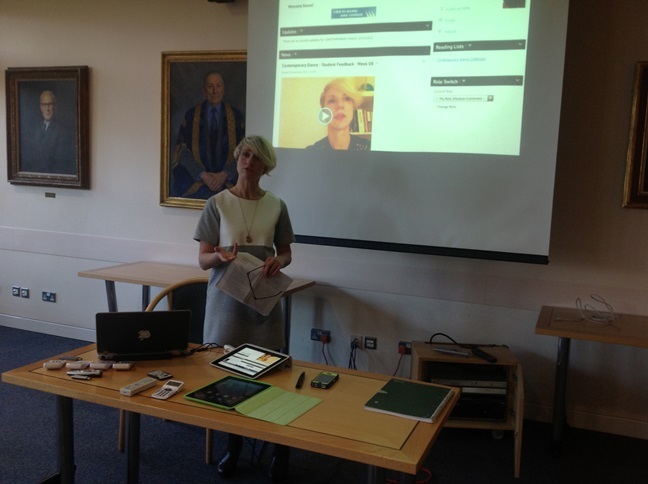 Karen demonstrated her use of embedded videos to provide additional feedback on a weekly basis to students, and showed how her students had maintained a high level of engagement with SurreyLearn through contributions to online discussion boards. Other staff who presented at this event included the School’s Director of Learning and Teaching, Christopher Wiley, who spoke about electronic voting systems, as well as Jason Spendelow (Psychology) and the event’s organizer, Colin Loughlin (TEL). Recordings of Karen’s and Chris’s presentations are available as case studies on the Surrey website at the following link: https://connect.surrey.ac.uk/p8sjir7tmf9/ (Karen from 12:41 and Chris from 22:31).